This Trumpet Orchestrion by Imhof & Muckle was made in London about 1870 for the Maharaja of Ambala in northern India. 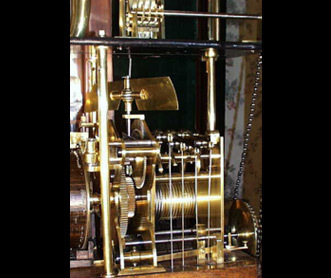 It has fifty-eight keys, with a total of 152 pipes, consisting of 48 wood, 86 tin and 18 brass arranged in six rows, together with 12 graduated tuned bells, 1 triangle and a snare drum with four beaters. 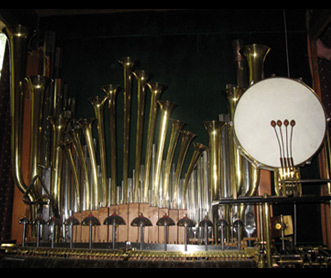 The orchestrion is powered by a weight which falls down a channel at the back of the instrument, connected over pulleys by a wire rope with a massive, hand cranked clockwork motor which drives a bellows consisting of four feeders plus a reservoir. There is storage through a side door for the six original wooden barrels each 7.25" in diameter and 32.5" in length. These are spirally-pinned with brass end indexing plates and a zinc tune sheet on the other. These barrels produce more than 25 minutes of music, playing European, American & Indian classical and popular tunes. 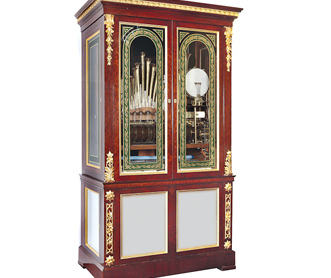 The orchestrion is contained in a magnificent mahogany case, with carved wood gilded embellishments and four gilded and engraved glass doors on the upper portion. 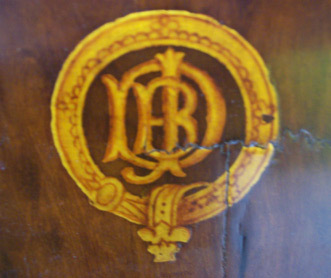 In the middle of the base are the initials of the Maharaja. The inscription on the tracker bar reads on one side: "Imhof & Mukle, International Exhibition 1862 and 1865" and on the other side; "547 Oxford St. London Prize Medal" and the number: No.1927. Size: Height 9' 0" width 5' 0" Depth (including cornice) 2' 10". 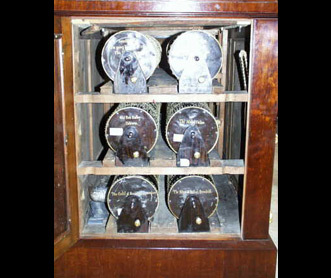 One of the recent graves discovered at the Thornton Heath cemetery in the UK is that of Daniel Imhof, the celebrated maker of music boxes. 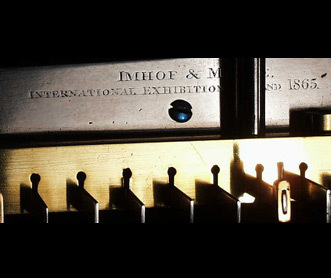 Originally from Germany, Imhof became a British national in 1856 and by 1883 his renowned shop, Imhof and Mukle (also spelled Muckle), was established in New Oxford Street. His retirement years were spent in Croydon and his sons carried on the business.